Reactions of diethylzinc with TEMPO were investigated. 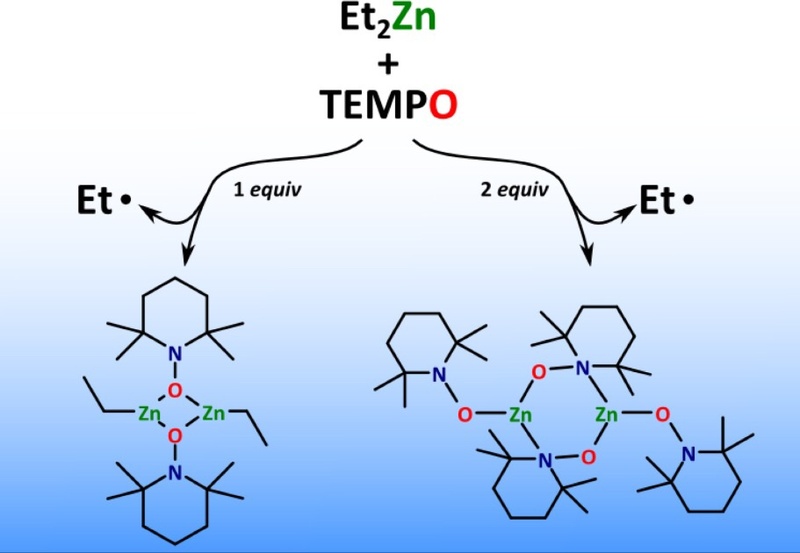 Dropwise addition of 1 equiv of TEMPO to Et2Zn at −10 °C leads to the nitroxide complex EtZn(TEMPO) in high yield, whereas upon addition of 2 equiv of TEMPO the corresponding homoleptic nitroxide compound Zn(TEMPO)2 is formed. Diffusion ordered NMR spectroscopy experiments revealed that both zinc nitroxide compounds exist in monomeric forms in solution, while single-crystal X-ray diffraction confirmed their dimeric structure in the solid state.